Ginger, baby. Ginger. 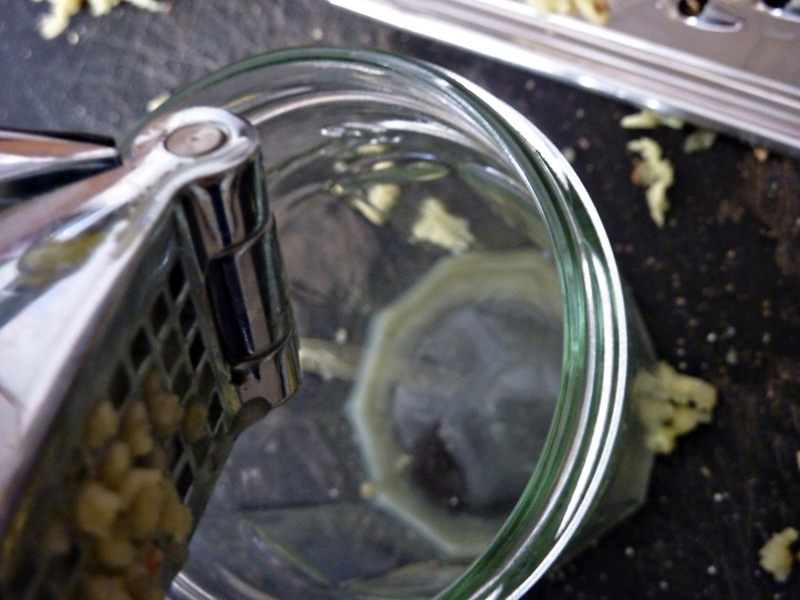 I spent many a morning trying to nail down the precise addition that ginger brings to my chai. Cup after cup, I would swirl and swish. Spice, yes. Fruity sweetness, yes. Fireworks, fo' sho'. It took me awhile, but I finally put my finger on it. Fireworks. In my mouth. Every sip. That's exactly what the ginger adds. Bright. Sparkling. Tingly. Just one more layer of complexity added to the overall blend. 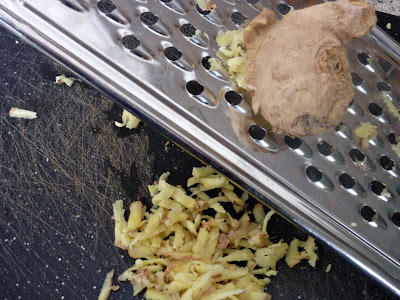 There are many different ways to include ginger in our favorite drink. Try one or all in your recipe until you arrive at the perfect level of firework action for your mouth. Option A.) Crystallized ginger. This dried out version keeps on the spice rack much longer than fresh ginger keeps in the refrigerator. I store it with all my dried chai spices so that I've always got a ginger option, should I forget to pick up the fresh stuff on my weekly grocery store excursion. Chop it into small pieces and add it along with the other spices to the rolling boil. 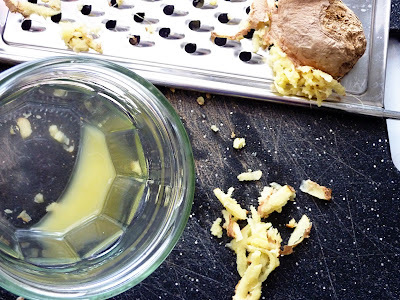 Crystallized ginger brings out the sweetness while muting the spiciness of fresh ginger. 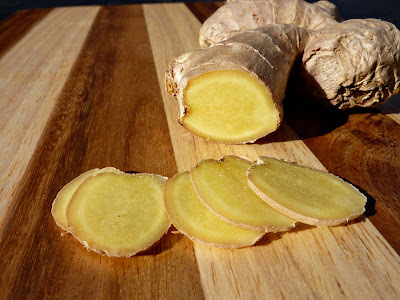 This is a great option for folks who enjoy a slight ginger flavor without that zesty kick you can expect from the fresh stuff. Option B.) Fresh ginger. Sliced or chopped. It doesn't matter if it still has the skin on it. You'll be straining all of the spices out at the end anyway. This offers a nice balance of both sweet and spice to the drink, without either being overpowering. Option C.) If you're a ginger lover, and you can claim it loud and proud, pressed ginger juice is the method for you. This is the grand finale of fireworks displays (in your mouth). 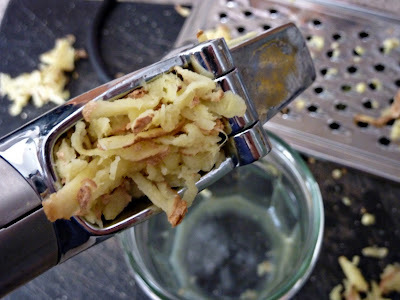 The easiest way that I've found to get fresh pressed ginger juice is to grate and press. 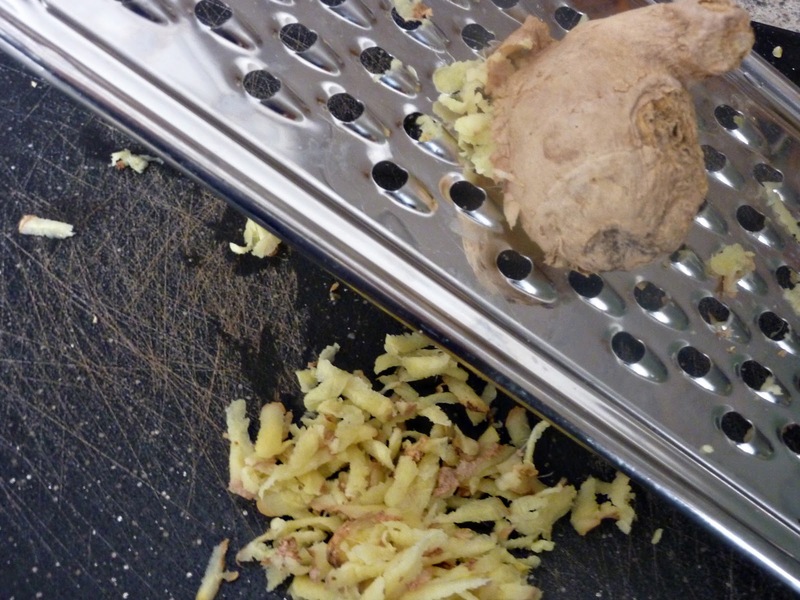 Begin by coarsely grating the ginger root. Pop it into a garlic press. 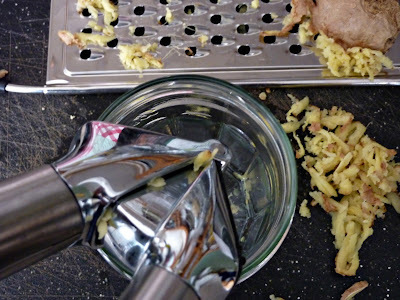 This was my meager attempt at getting an action shot of the juice streaming out of the garlic press. I can't seem to figure out how to capture a good flow. Any help on this topic would be much appreciated. If you've had success when it comes to snapping a picture of a flowing stream of liquid, leave your ideas in the comments section below. Thank you, kind helpful readers. And there you have it. 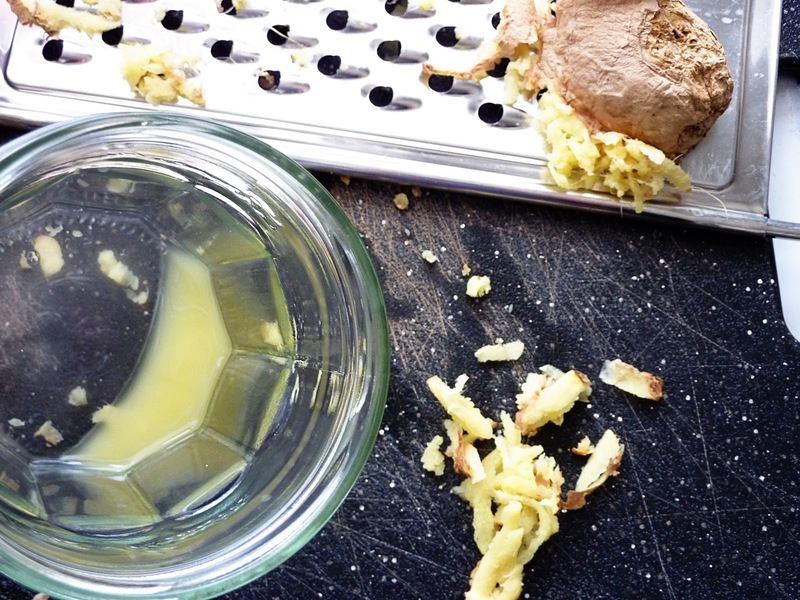 Fresh pressed ginger juice. I'm curious if you have other ideas on harvesting the spicy good stuff. This is my preferred method, but it does require a bit of a time commitment. It has been known to be the most time consuming segment of the entire chai crafting process. Please do share your thoughts and tips on this topic in the comments section below. Thank you, kind helpful readers. I've only heard this song about a million times and never knew what the heck she was singing in the refrain. Now I know.